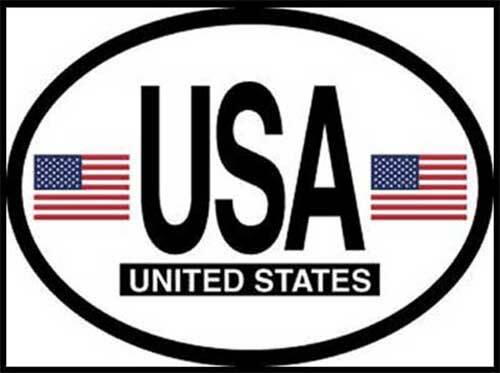 USA decal is printed on waterproof, laminated, durable vinyl stock with UV (ultra-violet) blocking inks. These decals are manufactured with non-permanent adhesives for easy removal making them great for cars, travel trailers and boats along with motor homes, trucks and motorcycles. USA, along with United States and the American flag is prominently displayed on this oval decal. The United States decal would complement any of the Irish decals that are available at The Irish Gift House. The USA decal measures 3 1/2" tall x 4 3/4" wide and it is made in the United States.